Yes! Our brand new casino site is finally here! The idea of Casinoseum has been brewing in our minds for a better part of 5 years. It was somewhere between 2012 and 2014 when we – a group of like-minded and fun-loving individuals—gathered around a table at our local Brighton pub. It was there and then where we started to reminisce about the good old days. Some may call us old-fashioned, but when you get older in life, you truly do become wiser and start to think about things retrospectively. It is our shared belief that casinos—as well as life in general—has been going downhill. Of course, the technology has gotten better and the games have, according to many people that we have spoken to, become more visually appealing than they used to be. For us, however, the things really have not changed for the better. Granted, if you are a person who likes to keep getting attacked by multiple colours and sounds every time that you spin the reels, then all the power to you! To us, we really liked the times when things were kept simple. All you did was tug on the one-armed bandit’s one single lever, and off you went. We did not yearn for more visuals back then, so why would we yearn for them now? We feel that as people, we have been somewhat programmed to like things that we did not use to like. It is the way that the world revolves. It is the way that the rich keep getting richer and the poor keep getting poorer. In other words, it is capitalism in its purest form. The man tells you that you should like the girl who sings on the radio, and bam, suddenly people are filling her pockets listening to the same junk music over and over again without even realising how empty and soulless it is. It really is a sad thing when you think about it. 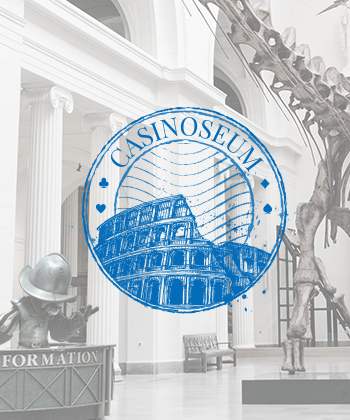 When visiting Casinoseum.com you should not leave our website empty-handed. Instead, you will be awarded all our insight and knowledge about online casinos and related subjects. We’ve been into casino gaming for a long time now, and this is the time for you to pick our brain! We are a group of friends who used to love visiting casinos when we were younger. It was not just a pastime for us—it was a part of who we were. We were young and rugged men, all in their early 20’s, drinking beer, chasing women, gambling and laughing a bit too loud. In the words of great Billy Joel; that never hurt no one. Then, all of a sudden, life happened and many of us got married, raised a family and had to cut down on drinking beer. That is when all of us actually stopped gambling as well since everyone had to make ends meet and the ones who were still single did not really care to play when the group had disbanded. After a few years, after many twists and turns and forks in the road, we have been reunited with our shared hobby of gambling. However, we have had to learn a bunch of new stuff and have had to adjust to the changes in the casino market. Many of our favourite brick-and-mortar casinos have closed their doors, and we have had to sign up to a few online casinos. It has not been ideal, but we do think that we have the knowledge now to talk about some of the recent happenings as well. If you are like one of us who still longs for the good old days but are still interested in modern gambling as well, we hope that you stay with us and read what we have to say!